3 nights hotel in Whitehorse (double occupancy), all other nights in 2 person tents, all required shuttles and transfers, introduction course in canoeing on swift moving water, canoes, paddles, lifejackets, complete cooking and camp gear, all meals during the canoe - and backpacking trip, all activities according to itinerary, experienced licensed guide, satellite phone on the canoe trip for your safety. You should be able to paddle ( not float) 4 - 5 hours a day comfortably. For the backpacking trip you should be in good physical condition for the 80 km long hike, mostly on a rough trail. Creek crossings are necessary, and you have to carry your backpack with appr. 15 - 20 kg. Elevation gain up to 800 m. Previous backpacking experience required. 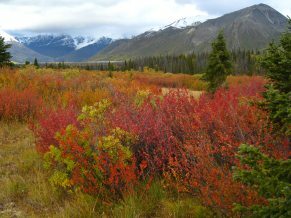 Unreal, fantastic, overwhelming: those are the expressions we hear when someone sees those autumn colors throughout the Yukon Territory. From the snow capped mountains in a blue sky, to the fire red bear berries on the alpine slopes, to the golden leafs of the poplar trees, you will find all stages of colors in one single picture. Sitting at the campfire on a crisp morning, you will see the mist slowly rising above the water, making way for another fine day with blue sky. Geese and Swans migrate south and we watch out for their formations when we hear them honking. The call of an Owl in the evening or the howling of Wolves and Coyotes mix with the crackling of the campfire. This unique experience means wilderness in its true sense. And we are right in the middle of it..
5 days Backpacking trip on the Cottonwood Trail through the heart of Kluane National Park. We cross two mountain passes, and wander through alpine meadows. There are several knee deep creeks to cross. We start with the canoe trip on Quiet Lake. The following two smaller lakes give ample time to get acquainted with the new element. For the next 11 days we follow the path of the Big Salmon River. Every day we move on, to set up camp at different locations. Sweepers and faster wateralternates with more sedate sections . Seasoned paddlers and ambitious beginners alike will be inspired by this untouched wilderness river. The beginning of September changes the color of the vegetation to a carpet of red and gold - Indian Summer we call it. Arrival in Whitehorse, pick up at the airport, transfer to your hotel. Time for discovering Whitehorse, last minute shopping before the trip. Instead of starting in a hurry, we use the second day to let you wind down and take in the atmosphere of Whitehorse and it's frontier attitude. From Whitehorse we drive for 250 km with our van to Quiet Lake, the start of the canoe trip. Surrounded by the rugged mountains of the Big Salmon Range the small lake system makes us feel at home in the wilderness right away. We have one optional rest day for a short hike, relaxing in camp, or building a sweat lodge in a traditional way. By now, the Big Salmon meanders through more open poplar country. Swift choppy water on the last day on the Salmon River makes for some excitement. From here on, we float down the River, with occasional stops. Relicts from the times of the gold rush are always interesting to explore. Fallen in log cabins, gold dredges and other mining equipment are all that remain of those heydays, more than 100 years ago. A native cemetery at Little Salmon is a last stop. Just before reaching the Village of Carmacks we end the trip. Here we get picked up by our van, and drive back along the Klondike Highway to Whitehorse. This evening we camp at the wilderness setting at Yukon Wild. here you can see what log cabin life is all about. Clients just taking part on the canoe trip, will stay in Whitehorse at the hotel. After sorting your gear for the upcoming hiking days we drive 150 km to Kluane National Park, the destination of our backpacking trip. A brief stop at the visitor center in Haines Junction gives us an overview about the whole park. 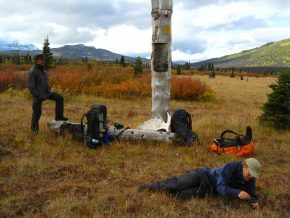 Close to Kathleen Lake, the start of the hike, we set up camp for the night. An evening walk along the lakeshore will open up the spirits for the following days. Along Kathleen Lake, surrounded by the steep slopes of the Auriol Range, we follow a historic trading trail . We have to cross some mountain creeks before we reach Cottonwood Pass. Now we are in the alpine, with far reaching views in both directions. Here it is easy to spot animals like Bears and Dall Sheep. For 2 days we will be above tree line with unobstructed views. In the distance we see the stretched out expanse of Mush Lake, before we descend Dalton Pass into the Alder Creek valley. At the end of day 5 we reach the end of the trail and move on to Whitehorse by Van. A hotel room and a hot shower waiting for you. A Dinner with the group rounds of an amazing 3 week wilderness trip.